March of Time blurred the lines between news and entertainment in curious ways that forever changed the way we hear news. In an effort to dramatize current events, producers sought to produce a show of "News-acting" on the radio. From its debut on March 6, 1931 on Friday at 9:00 PM, the show lead listeners through current events with narrators, first Ted Husing, Harry Von Zell, and then Westbrook Van Voorhis. Harry Von Zell was the most well known of these narrators; he also narrated the popular comedy show, Burns and Allen. March of Time old time radio show portrayed many leading world figures and events including Adolf Hitler, Benito Mussolini the Spanish Civil War. The two dictators were portrayed as humans with faults and failures and thus could be defeated in war -- this notion gave many Americans hope that WWII would end in their favor. Big name performers including Agnes Moorhead, Nancy Kelly, Art Carney, Orson Welles, and many more portrayed the villains, heroes, and witnesses of the true events both large and minor. The show has been long studied by scholars for its propagandistic effects because many people believed that the show's portrayal of the news was authentic and unadulterated. It created a cataclysm of authenticity. This collection includes the few rare shows know to exist. You remain an amazing customer centered company. Love the nostalgia, keep it coming. 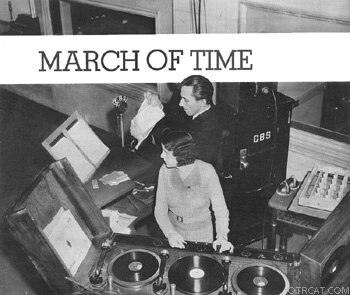 THE MARCH OF TIME is a gem of a collection of these truly historic broadcasts. History, as dramatized with some of Radio's finest actors of the period, playing people in the news. Listen how Art Carney does FDR, and how Westbrook van Voorhees, The Voice of Doom, makes his iconic narratives. The past comes alive!